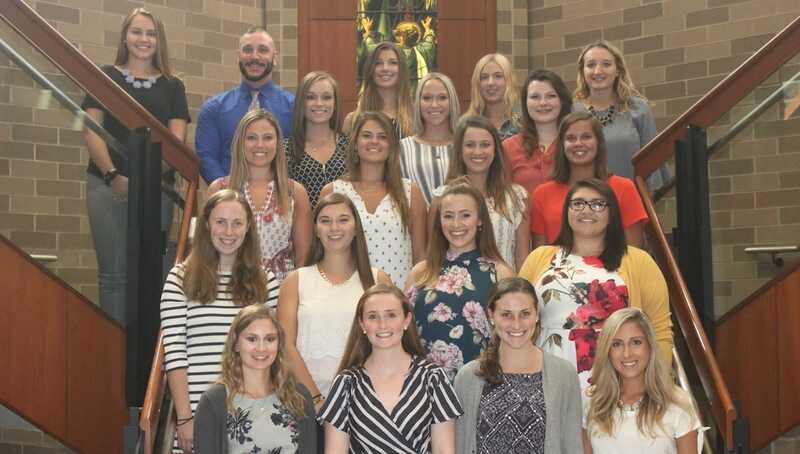 Twenty-one University of Scranton education majors are serving as student teachers during the fall semester at 10 different local schools. First row, from the left are: Jordan Delicato, Sarah Breen, Megan Turner and Gabrielle Pranzo. Second row, from the left are: Kathleen O’Neill, Victoria Binetti, Samantha Milite and Jasmin Colon. Third row, from left are: Olivia Heyser, Samantha Marchesano, Rebecca Loonstyn and Emily Crozier. Fourth row, from left are: Taylor Septer, Samantha Kellar and Brianne Niewinski. Fifth row, from left are: Lauren Seitz, Marc Habel, Hannah Buckenmaier, Celine Hermann and Danielle Remy. Absent from photo is Jamie Weaver. Twenty-one University of Scranton education majors are serving as student teachers during the fall semester at 10 different local schools from the following nine school districts: Lackawanna Trail, Dunmore, Forest City Regional, Mid Valley, Valley View, Blue Ridge, Wayne Highlands, Western Wayne and Wyalusing Area. Following is a list of the student teachers and the schools at which they are serving during the fall semester. Jamie (Kintner) Weaver of South Abington Township will student teach at Wyalusing Valley Elementary School.